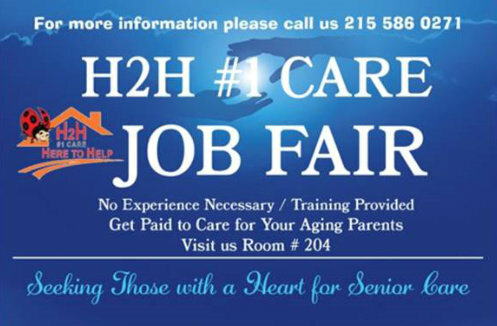 H2H #1Care, LLC is an Equal Opportunity Employer, dedicated to a policy of nondiscrimination in matters involving our patients and our employees. H2H #1Care, LLC does not condition, exclude or deny admission or care of any national origin, citizenship status, creed, gender, marital status, sexual orientation, political affiliations, medical condition, disability or handicap, or any other basis prohibited by federal , state or local law. CAREGIVERS GET THE HIGHEST POSSIBLE PAY RATE!!! IF YOU ARE NOT HAPPY WITH THE RATE THAT YOU ARE GETTING PAID AT OTHER PLACES, ALL YOU HAVE TO DO IS BRING US PROOF OF YOUR EARNINGS AND WE GUARANTEE TO NEGOTIATE A BETTER RATE! If you meet the requirements and qualifications stated, do not hesitate to submit your resume below.